What is secure socket layer? What does it mean to be a secure website? A secure website is indicated by seeing HTTPS in the browser, and an SSL icon like a lock sign or green bar. This reveals the presence of an SSL certificate on the website, which encrypts information sent by the visitor to the web server. HTTPS stands for HyperText Transfer Protocol Secure. The “s” indicates a secure connection that is provided by an SSL certificate. You’ll usually see an SSL icon when you visit a HTTPS site as well. 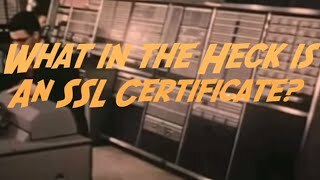 SSL certificates can be as cheap as $10.00 a year or cost upwards of hundreds of dollars. However, different SSL certificates offer different benefits and various levels of security. When buying an SSL certificate, compare the plans to determine which meets your website’s needs. Name.com recommends these SSL certificates to any business or individual looking to secure their website. See the best of our offerings here. Browse our entire list of available SSL certificates to determine which one is right for you. From Domain Validation to Extended Validation certificates, there’s a secure solution for website of all types and budgets. SSL certificates that offer a wildcard feature allow them to protect not only your primary domain, but also any subdomains under it. This feature is ideal for businesses that want to secure multiple branches of their main website. Domain Validation (DV) SSL certificates offer the most basic level of validation. It’s ideal for businesses who are looking for a quick and inexpensive solution for securing parts of their website. Organization Validation (OV) SSL certificates are the most cost effective way for online businesses to protect customer transactions with high assurance SSL security. They require additional documentation from applicants to confirm domain ownership and business identity. An Extended Validation (EV) SSL certificate is the highest-assurance certificate available and delivers a new level of trust for your web site. EV certificates use a set of checks and balances to verify business identities. It is the only SSL certificate to feature a green address bar in web browsers, and prevents online fraud by establishing secure connections. Comodo offers flexible and affordable SSL solutions for businesses of all types. With a wide range of certificates that suit the needs of all business types, you’re sure to find a Comodo certificate that fits every encryption need. Encryption has never been easier with Rapid SSL. Certificates are issued in minutes and are easy to install. It’s the perfect solution for starter eCommerce websites. As a trusted SSL certificate provider, Symantec provides billions of security solutions to companies and individuals around the world. It’s the go-to choice for businesses seeking additional security for their website from a recognizable brand. GeoTrust is the world’s second largest SSL provider, with customers from over 150 countries.Their range of products allows businesses of all sizes to secure their digital transactions at an affordable price. Upgrade your SSL certificate to one of our affordable, high-security options. Access premium features such as a green address bar, warranty, and encryption for your subdomains. These certificates offer higher levels of protection for your customers and website, ensuring that all sensitive data remains secure. Ready to secure your website? Check out these popular SSL options, which offer high quality encryption for websites of every kind, at every budget.